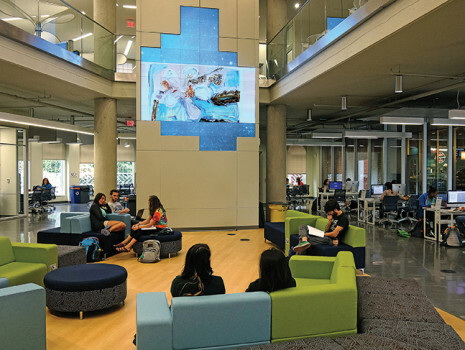 Colleges and universities have been integrating use of Digital Signage as part of their communication strategies ever since the early 90s, when Digital Signage started to become common in public spaces. Back then, we typically saw static billboards with lit bulbs, which eventually progressed to digital projectors, then finally LED displays. Digital Signage in colleges and universities has come a long way since its inception; and now more than ever, we are finding educational institutions are making digital signage an imperative part of operating effectively. From wayfinding to upselling, well-placed signs with the right content can make or break visitors’ experiences. Here we will list and discuss some of the ways that Digital Signage is used in educational institution campuses. With multiple buildings, classrooms, lecture halls, etc., finding your way through a campus can be challenging. Interactive wayfinding solutions can help solve this problem. Touchscreen maps can be available at the entrances and exits of buildings.Type in where you need to go, and instantly be shown a directional map of how to reach your destination. Display digital signage in areas with plenty of traffic, or areas where students tend to hang out. This will ensure that major announcements receive maximum exposure. Video walls are also useful in broadcasting message in life-size and are very impactful. Campus cafeterias are essential for the wellbeing of the students and staff. It’s important that the faculty are informed about their food options – nutritional value, menu items, prices, promotions, etc. They need to fill their minds before filling their bellies! With technology changing and improving lives at such a rapid pace, libraries are not the informational hubs of universities as they once were – they are now seen as more of “community hubs” where people interact and learn together. Most of the information that we access today is found online, though libraries are still used as workspaces and provide material that cannot be found on the internet. Libraries contain a seemingly endless amount of resources, which can present challenges. Digital signage can help students find materials that they need, show when available workspaces are open, and promote sale items. Books with RFID tags can trigger content on nearby displays to help people find related reading material. Students can become tired of sitting around and waiting for computers to become available. Digital Signage can show which workstations are available, how long the estimated wait time is, and where you stand in queue.